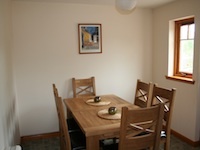 The self catering accommodation extends over two levels with lounge, three bedrooms, family kitchen and dining area. The living room is spacious enough to seat six adults comfortably with three leather sofas and a large coffee table. There is a 37" high definition LCD TV with satellite television and a hifi system, with iphone/ipod docking, and CD player on which to play your music. DVDs, Blu-rays and games can all be played on the PS3 games console. A large cupboard provides storage space. 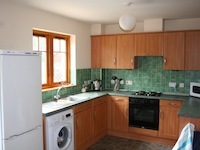 The sunny south facing self catering kitchen is well equipped with: fridge-freezer, electric oven and 4-ring hob, washing machine, dishwasher, microwave, toaster and kettle. A large oak table in the dining area seats six in comfort. 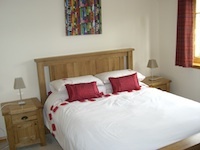 The master bedroom is furnished with a kingsize bed and oak furniture. There is a fitted wardrobe with mirrored doors. 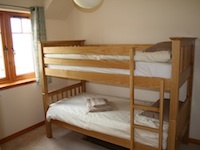 Bedroom 2 is furnished with pine bunk beds and a matching chest of drawers. There is a fitted wardrobe with mirrored doors. There's an LCD TV in this bedroom that can be used for the PS3. 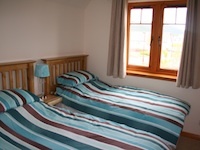 Bedroom 3 is furnished with twin beds and a pine chest of drawers. A large fitted wardrobe provides additional storage space. The bright and modern bathroom is fitted with a bath and electric shower, WC, hand basin and electric shaver point. There is a second WC and hand basin situated in the cloakroom on the ground floor. 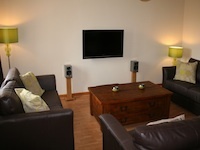 For a quiet evening in after a busy day out, or for those rainy days, Farragon Self Catering is equipped with a full range of home entertainment systems for you to enjoy. Large LCD television with satellite channels. PS3 for games and dvds. BBC iplayer access over broadband from the LCD TV. Wifi access to broadband for your laptop. Hifi system with iphone/ipod docking station. Farragon Self Catering has a south facing fully landscaped rear garden. Garden furniture and bike locking facilities are provided.